FAYETTEVILLE (WTVD) -- A Fayetteville mother is outraged after her autistic son arrived home from school Thursday with a bloody gash on his forehead, a bruised nose, and a cut on his lip, and the only notice she received was a hand-written note. "All I saw was a big bruise on his head, red, dripping, nose dripping, and I backed away from the bus and started crying. He can't talk. I don't know if he's hurting, in pain," said mother Natalie Simmons. The shaken up four-year-old was carrying a wet towel given to him by his bus driver and a hand-written note from a teacher at Brentwood Elementary. 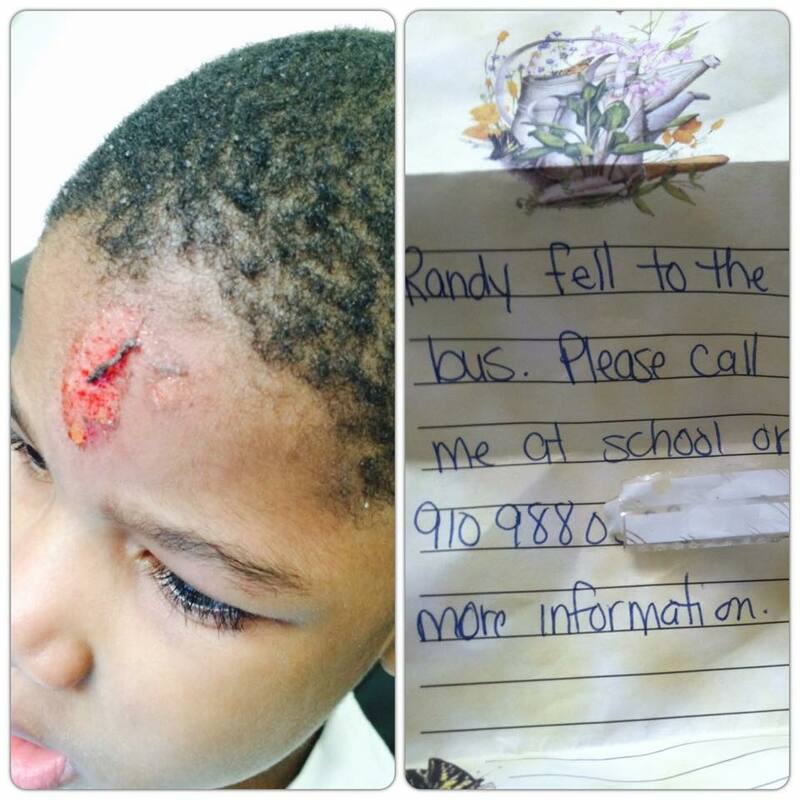 Simmons took a picture of her son Randy's bloodied face and sent it to ABC11 on Facebook. "The note said, 'Randy fell (coming on) to bus, please call as soon as possible,'" she said. Simmons called the school, but got no answer. She immediately took her son to a local emergency room and ordered a CAT-scan for his injuries. "I'm thinking he's going to be okay in school, and he comes home looking like that, and I don't know until after he pulls up? I was very upset," she said. Simmons later learned her son fell while walking with a teacher's assistant, but he did not receive medical attention. Simmons said she never received a phone call about the accident, even though she left multiple numbers with the school, including up-to-date emergency contact information. "I understand falls and slips happen. That's what kids do, but how they handled this was totally wrong. Totally wrong," Simmons said. We agree that this was an unfortunate accident. The principal has met with the parent and apologized. There was obviously a breakdown in communication. We are checking our school database to see why we did not have a 'good' phone number for the parent and updating it with the most current information. The school district did not say if anyone would be disciplined over the incident.